Today’s workforce is increasingly mobile and the number of employees working from multiple and remote locations is rising. According to a recent remote and mobile user study, 70% of organizations are concerned with data loss when users are off the network and 75% worry that malware will infiltrate the network due to increased roaming or off-network access. Infoblox ActiveTrust® Cloud helps raise security to the next level. It blocks DNS-based data exfiltration, stops malware communications with command-and-control (C&C) servers, automatically prevents access to content not in compliance with policy, and shares intelligence with your existing security infrastructure for orchestration and faster remediation. The solution provides these benefits using automated, high-quality threat intelligence feeds, behavioral analytics, and machine learning to catch even zero-day threats. Delivered as a service, it is easy to use, deploy, and maintain without dedicated IT resources. It provides rapid time to value and enables unified policy management and reporting for on-premises/cloud hybrid deployments. It protects devices everywhere and is ideal for organizations who want to consume services from the cloud, or are concerned with extending protection to remote/branch offices. Infoblox ActiveTrust® Cloud automatically stops DNS-based data exfiltration using Infoblox Threat Insight, a unique streaming analytics solution that automatically adds domains associated with data exfiltration to Response Policy Zone (RPZ) blacklists. ActiveTrust® Cloud helps detect malware early, and without the need to deploy infrastructure everywhere. Through its Infoblox DNS Firewall capability and the use of advanced threat intelligence, it disrupts device communications with malicious destinations. Threat intelligence feeds are regularly updated with malicious Internet destinations and curated by a dedicated threat intelligence team to deliver fewer false positives. When used along with the on-premises ActiveTrust® solution, ActiveTrust® Cloud empowers administrators to seamlessly manage policy and get analytics and reporting with a complete lifecycle view of device activity, whether users are on the enterprise network or roaming. The solution also provides centralized reports enriched with on-premises Grid data that provides deep visibility for better understanding and prioritizing threats. 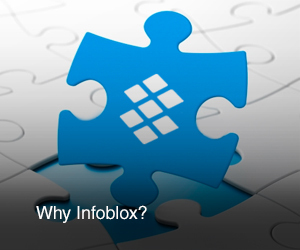 Infoblox is the market-leader in delivering next level DDI to organizations the world over. Unique in the industry, our ActiveTrust and ActiveTrust Cloud solutions support a hybrid model that bridges on-prem and cloud security deployments. With Infoblox, you can centrally and efficiently protect against the broadest range of DNS-based threats, including malware, ransomware and data exfiltration, regardless of your particular security infrastructure requirements. Prevent DNS-based data exfiltration that other systems can’t detect (e.g., DGA and fast-flux). Prevent malware from propagating by disrupting malicious DNS-based communications to C&C servers. Prevent access to objectionable content or content not in compliance with policy. Aggregate, curate and distribute up-to-date threat intelligence to Infoblox and broader security ecosystem. Redirect DNS requests to Infoblox cloud using either the endpoint agent or the agentless DNS forwarding proxy option. Respond to threats faster by pulling security event data into ecosystem tools using public APIs or on-premises Infoblox. Access rich context on infected devices and user activity through the Data Connector utility. Take action in minutes, not hours with a threat investigation tool that provides fast analysis based on threat context.